For me, wintertime means lots of things in the oven and while I was roasting up some root vegetables last night I decided to make these baked stuffed zucchini with some leftover brown rice thrown in as well. The recipe is very easy and customizable to what you have (or don’t have) in the fridge. Try it with carrots/celery, tomatoes, green onion, nuts (pine nuts sound nice), breadcrumbs, brown rice, kasha, barley etc. I didn’t have mushrooms last night but like it that way best (but I am a mushroom lover). You can cover them with cheese or leave that off. Kids especially love these zucchini “boats” or if you have a round zucchini that’s fun too! 1. 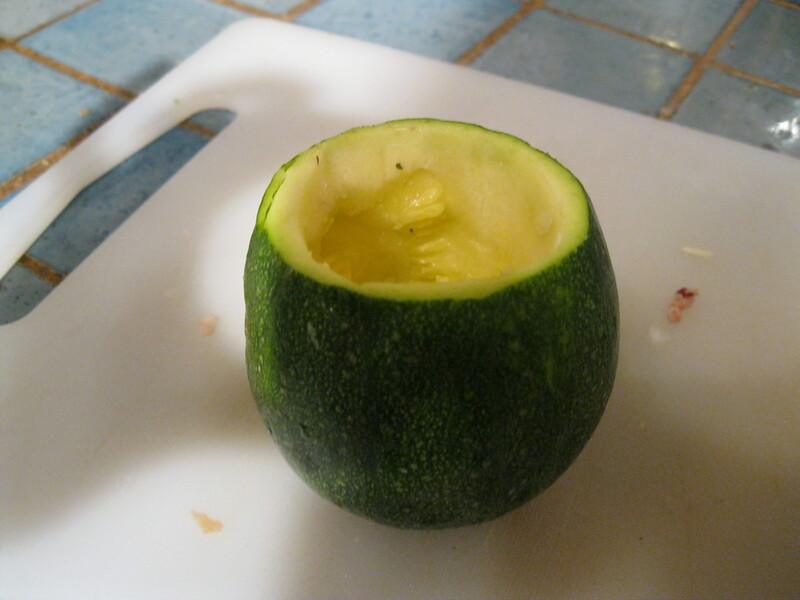 Cut zucchini in half lengthwise, or cut off top if using a round zucchini. 2. Scoop out pulp, leaving a 1/4-in. shell. Chop pulp; set shells aside. 3. 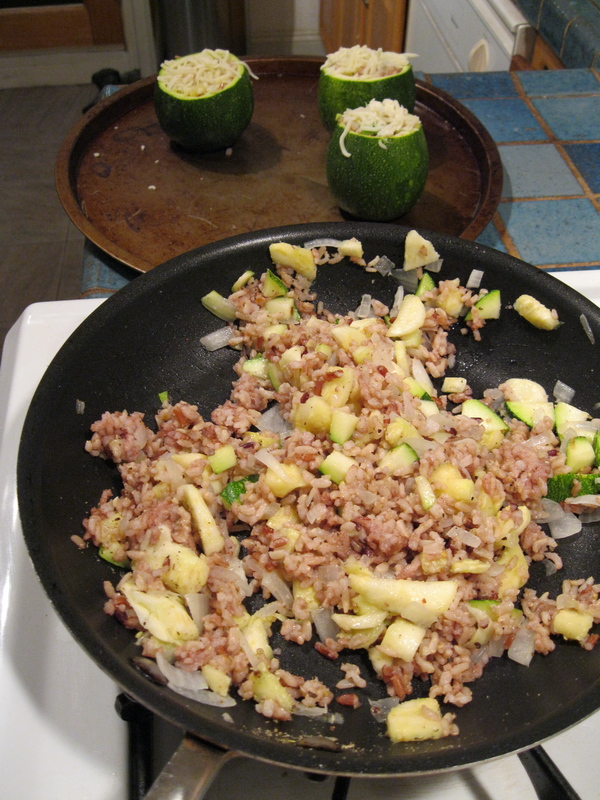 In a skillet, saute the zucchini pulp, mushrooms and onion in olive oil for 3-4 minutes or until tender. Add grain ,wine or broth. Reduce heat; simmer, uncovered, for 10-12 minutes or until liquid has evaporated. Stir in salt and pepper. 4. Fill shells with mixture. Sprinkle with cheese. Bake for 20 min and the then broil 3-4 in. 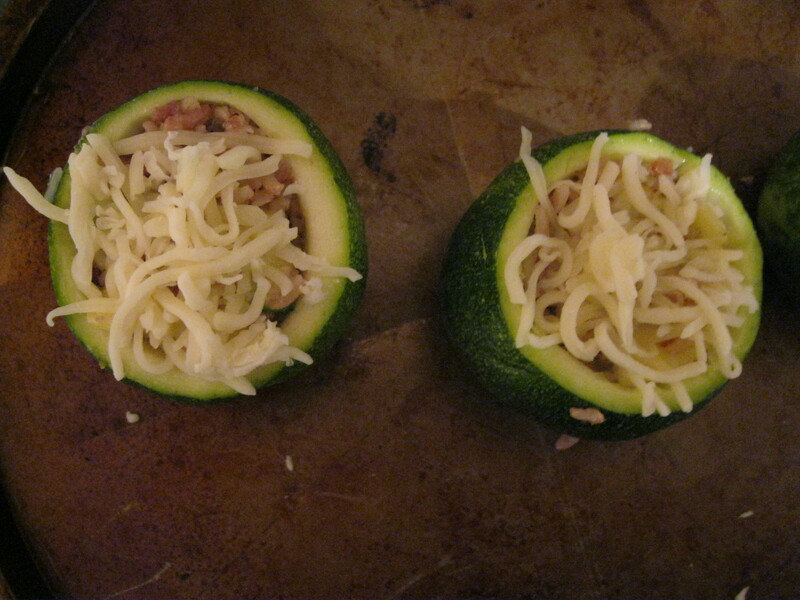 from the heat for 3-4 minutes or until cheese on top is lightly browned.